5-A-DAY PORTIONS One serving of this recipe counts as 1 of your 5-A-DAY target of fruit and vegetable portions. Mix the canned steak and half the can of fried onions, drain, reserving the liquor, stir through a tsp oil and season. Cut eight 9cm diameter discs out of the pastry, press four discs into a bun tin, 5cm in diameter and fill with the pie mix and top with a little more truffle oil. Brush the pastry edges with egg wash, cover with the remaining four pastry discs, press down the edges and seal around with a fork. Brush the lids with the remaining egg and pierce a hole in the tops. Place back in the fridge to reset the pastry. Drain the mushrooms and add to a pan with the double cream and some seasoning, heat for 10 minutes on a low heat then blend to a puree. Reduce the beef stock and add the reserved liquor and a little truffle Keep warm. 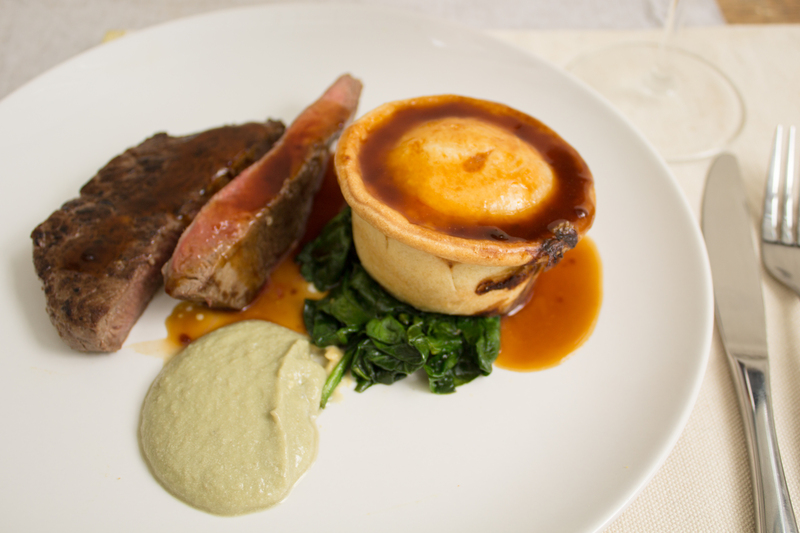 Cook the steak and greens to your liking and serve with the pie, puree and gravy.